Beautiful Corfu, the most northerly of the Ionian Islands, is easy on the eyes. Filled with natural beauty, the island boasts rolling green hills in its south, and rugged limestone rock formations in its north. It also has a mild climate, lush Mediterranean vegetation, and some stunning beaches and underwater caves and tunnels. As such, Corfu is a popular tourist destination with many things to do - tourism is the main source of revenue here. The island also comes with its share of history. 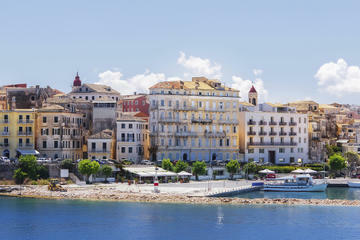 From 1386 to 1797, a period that gave it much of its most beautiful architecture, Corfu was held by the Venetians. Then, along with the rest of the Ionian Islands, it was under the British from 1815 to 1864. Corfu Airport lies five kilometers south of Corfu Town. Plan your visit with our list of the top attractions on Corfu Island. The island's lovely capital, Corfu Town, is a warren of cobbled alleys and elegant Venetian-era buildings, many of which now host informal seafood tavernas and souvenir shops at ground level. Centering on the Esplanade, an expansive green square, the UNESCO-listed old town is guarded by two imposing 16th-century fortresses and also includes a number of churches, like the Church of St. Spyridon, which is easily recognized by its red-domed bell tower. The waterfront incorporates a port, with regular ferries to Igoumenitsa on the Greek mainland, and daily excursion boats to neighboring Albania. Just outside the village of Gastouri, 10 kilometers southwest of Corfu Town, this white Neoclassical villa was the summer escape of Sisi, Empress Elisabeth of Austria (1837-1898). A lover of beauty, Sisi immersed herself in Greece's mythical history and lush nature. You can see inside the grandiose villa and explore the gardens, which are filled with towering palm trees and Neoclassical statues to give you some idea of the idyllic world Sisi was seeking. In the northeast of the island, 36 kilometers north of Corfu Town, this traditional fishing village has retained its character despite its popularity. Overlooking a pretty harbor filled with wooden fishing boats, it offers a choice of seafood tavernas and cafés, which are popular with affluent Brits and Italians, some of whom have villas here. Calm and unhurried, it is especially noted for its numerous small coves with white pebble beaches and amazing turquoise blue sea. The best way to explore this stretch of coast is to hire a small boat. For amazing views hike up to the ruined Byzantine castle on the hillside behind the village. On the west coast, 25 kilometers northwest of Corfu Town, Paleokastritsa encompasses a glorious stretch of indented coast, with six deep, curving bays sheltering lovely beaches, both of sand and pebble, extending to a crystal-clear, blue sea. It's popular with day trippers, so it does get busy in peak season. In the hills rising above the coast, you'll find another attraction - a 13th-century monastery with a courtyard garden, church, and small museum. Considered by many to be the very best beach on the island, Glyfada also lies on Corfu's west coast, 26 kilometers west of Corfu Town and two kilometers south of the village of Pelekas. A blissful, long stretch of fine golden sand beach, it's lined with sunbeds and umbrellas and backed by hillsides covered with pine woods and olive groves. A couple of big hotels and apartments are in the area, and tourists will also find tavernas, cafés, and water sports facilities, including jet skis, pedal boats, and banana boat rides. Facing west, it has amazing sunsets but does get very busy in summer, especially in August. On Corfu's northwestern tip, about a 20-minute walk from the equally intriguing small village of Sidari, the Canal d'Amour is one of Corfu's top natural wonders. It boasts impressive sandstone rock formations that create a natural passage from its small beach into the Ionian Sea's sparkling blue waters. You can jump off rocks into the warm, salty sea and then swim through tunnels and caves for awesome, fishy underwater explorations - snorkeling equipment can be rented at the beach where there are also sun-loungers and umbrellas for hire. La Grotta Beach in Paleokastrttsa is on Corfu's west coast and is another one of the island's most stunning beaches. The beach itself is small and rocky, but head into the clear blue waters, and you'll find an underwater world filled with colorful fish. The beach also boasts a diving board and a jump rock from which you can leap into the sea below. The beach gets crowded in the summer, but there are some rocks you can also stretch out on in the vicinity. In the north of Corfu, the highest point on the island, Mount Pantokrator rises 906 meters. A road leads all the way to the top, so you can drive up, though some people prefer to hike from the village of Perithia (the walking time is approximately two hours). At the top, the Pantokrator Monastery dates back to the 14th century, though its present appearance is mainly from the 19th century. The views from the summit are stunning, with Albania to the east, the Diapontia islands (Mathraki, Erracusa, and Othondi) to the north, and the islands of Paxos and Anti Paxos to the south. On a clear day, you can even see the southern tip of Italy some 130 kilometers away. The Corfu Donkey Rescue in Paleokastrttsa is well worth a visit for animal lovers. One of the top things to do on this part of the island, it offers refuge to homeless donkeys that have been abandoned or need a safe place to live out their retirement years (donkey's used to be an integral means of transport and work aid in Corfu). The sanctuary is located on a beautiful piece of land filled with olive trees and a mountainous backdrop, and visitors can hang out with the donkeys daily between 10am and 5pm. There is no entrance fee, but a donation is greatly appreciated as this is a charity organization. In the Ropa Valley, 17 kilometers from Corfu Town, this beautifully landscaped 18-hole golf course was designed by Swiss architect Donald Harradine. It incorporates natural elements such as the River Nafsika, as well as several lakes and meandering streams and is popular with both beginner and advanced players. From March to November, it enjoys warm sunshine and blue skies, plus a cool sea breeze. It is open daily and has golf clubs for hire. Luxury Hotels: Delfino Blu Boutique Hotel & Spa is one of the top properties in Corfu. On a hill overlooking the sea with beach access, the hotel offers excellent service, and rates include a wonderful hot breakfast. In the summer, it has a minimum night stay requirement. Other luxury options include MarBella Nido Suite Hotel & Villas, which is an adults-only five-star property overlooking the Strait of Corfu. And Domes Miramare, which is also adults-only. It is set on a private stretch of white-sand beach and features stylish rooms, suites, and villas. Mid-Range & Budget Hotels: In the mid-range price bracket the Art Hotel Debono is a good-value four-star hotel in Gouvia. This boutique property has clean and comfortable rooms and is nestled amid olive groves and woodland. There is also a lovely swimming pool and hot tub. Another excellent choice in this price-range is the Philoxenia Hotel, which is a family-friendly property not far from Corfu town and by Ermones beach. Also popular with families, especially those in search of more space, is Matoula Apartments, which is also by a beach and very good value. Small Group Tour of Corfu: If you don't have a lot of time to explore Corfu and want to make sure you don't miss anything around the island check out this Small-Group Tour of Corfu. It hits all of the island's must-see attractions in a full day of sightseeing by coach. 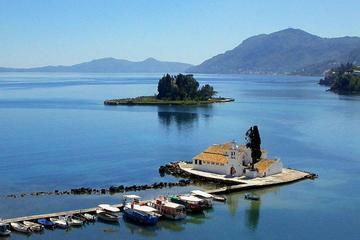 You'll explore Corfu Old Town, Palaiokastritsa and its beaches, and other attractions. Along the way, you'll also learn about Corfu's culture and history. All about Corfu's History: Another tour option in Corfu is to dig deep into history with this Achilleion Palace and Corfu Old Town Tour. This guided tour takes you to the Achilleion Palace, a Neoclassical palace inspired by Greek mythology that once served as an imperial residence. After touring the palace, you'll head to Corfu's Old Town for an in-depth walking tour. Athens: No visit to Greece is complete without seeing Athens, one of the world's most important historical cities. One could spend ages in Athens without seeing everything, so if you are short on time, check out our article on the Top-Rated Attractions & Things to Do in Athens. The city also hosts a plethora of sleeping options for all budgets, but our article Where to Stay in Athens: Best Areas & Hotels breaks it all down for you. Greek Islands: Greece is home to some 6,000 islands, including Corfu, and you could easily spend months just island hopping from one to another without getting bored. One of the most famous Greek islands is Santorini, which is known for its dramatic architecture, views, and outstanding cliffside resorts. For more on exploring this special place, see our articles on Where to Stay on Santorini: Best Areas & Hotels, and for things to do, our piece on Top-Rated Tourist Attractions on Santorini.